"Winter's a good time to stay in and cuddle!" ... but wear this is summer and you'll be a puddle! Well, probably. Cause if your kids put on this giant fuzzy pajama costume shaped like their favorite singing snowman, they'll be great in the winter. Comfy. Cozy. But they probably won't deal with the summer heat that well in a full-body costume sack. They might melt from warmth. But hey, at least they'll be in character! Who knew that when Disney released another princess movie a joyful singing (oftentimes dismembered) snowman would steal the show. We can understand why though. He's sings catchy tunes. He's indelibly happy. He's nearly indestructible. And he likes warm hugs! (Stop it Sven!) He's just an all-around good sidekick to have. 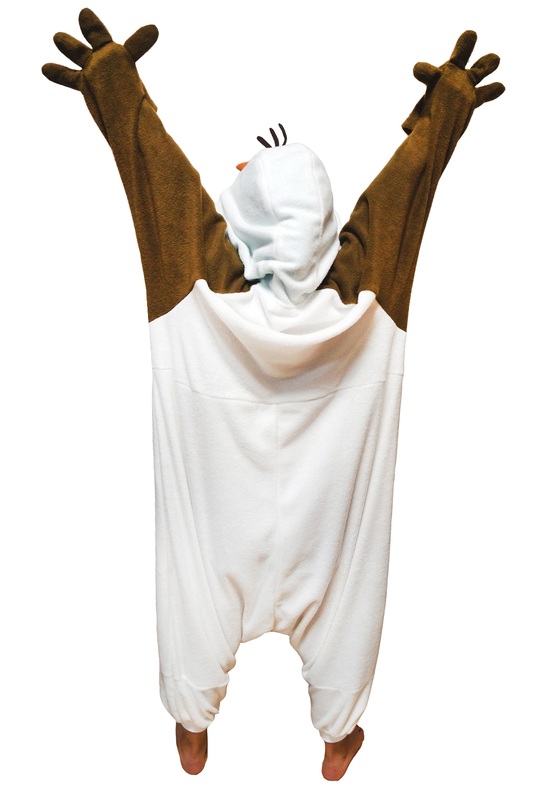 So if your little sidekick wants to be the talented Olaf, consider our Kids Olaf Pajama Costume. Great for dress up, naps, and or just running around and bursting into song and dance. This costume got all the details right: giant black buttons, brown arms, Olaf's face on the hood, and a giant carrot for a nose (we like it even more now). Did we mention roomy and fuzzy? Fleecy and warm? It's like your kid will be wearing a warm hug! They'll love it so much they might never take it off. But that's okay. Because some characters are worth melting for.